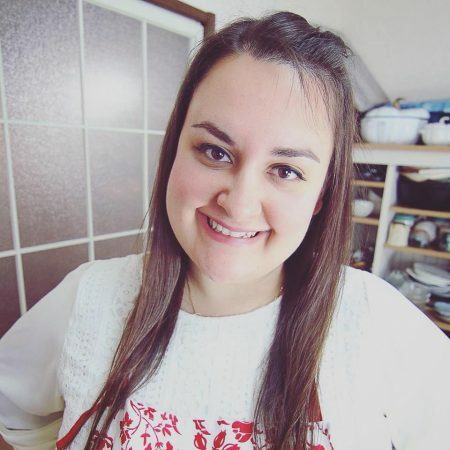 When I first started my PCOS diet, I realized there were a lot of food that I couldn’t eat anymore. This included pasta and fried things because they were always coated with flour. Whenever I feel like eating something that I used to eat, I just need to figure out a way to make it so that if fits into my diet requirements. I felt like eating some chicken parmigiana all week so I decided to make some and made sure that it would be low-carb and gluten-free. 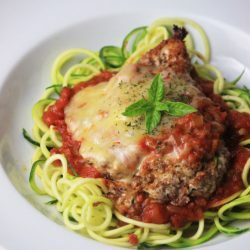 I decided to use zucchini for the noodles, and coated my chicken breast with some almond flour for the “breading”. I made myself a simple marinara sauce and used some Jersey cheddar. You could use any type of cheese you want, or no cheese at all if you’re on a Paleo diet. I’ve seen multiple recipes that ask to cook the zucchini noodles for 5ish minutes, but I find doing that makes them all soggy and super watery. I like to either eat them raw or cook them for 30 seconds just to warm them up. For the chicken, I coated it with almond flour and pan-fried it in some coconut oil. I made a simple marinara sauce with some fresh basil, parsley and oregano from my garden. 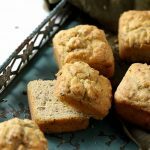 Because this recipe only uses healthy and fresh ingredients, it is extremely low carb! 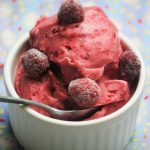 Only 9.26g net carbs per serving! 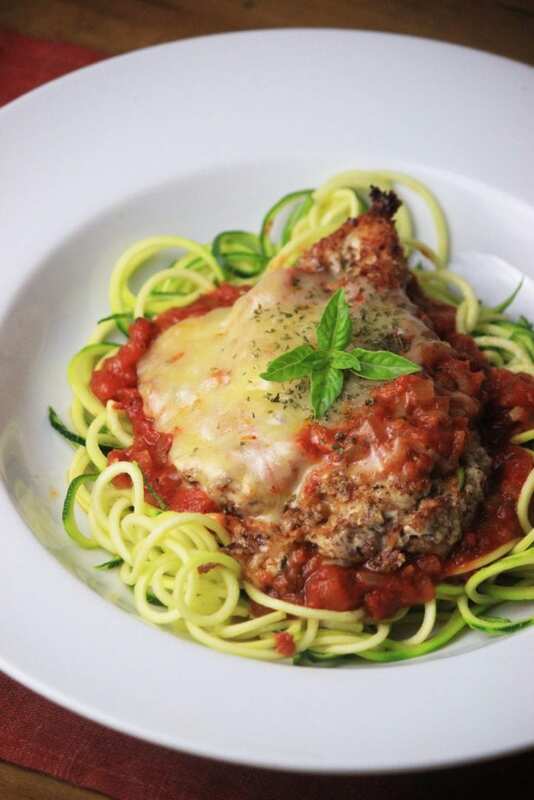 A healthier alternative to the popular chicken parmigiana! Spiralize each zucchini using your spiralizer. Thinly dice the onion and garlic. Mince the fresh spices. In a sauce pot, add the olive oil and heat. Add the onion and garlic and cook until soft, 2-3 minutes, on medium heat. Add the tomato can and water to the pan. Add the chopped spices, bay leaf, salt, pepper, and tomato paste. Mix well and simmer on medium-low heat for 15-20 minutes or until the sauce has thickened. Slice each chicken breast into 2 pieces. Sprinkle the salt and pepper over each breast on both side. Sprinkle the almond flour over each breast and make sure all sides are nicely coated. 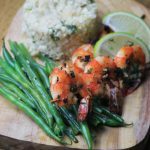 Add the coconut oil to a large cast iron skillet and heat on medium heat. Add the breasts to the pan and fry. Cook 5-7 minutes on both sides, or until a thermometer inserted in the middle of the breasts registers at 65C/150F or higher. You can either eat the zoodles cold or cook them in a separate frying pan without oil for 30 seconds - 1 minute until they're warm. When the chicken is cooked, pour the tomato sauce over the chicken and sprinkle the cheese over. Cover and cook for 1 minute, just until the cheese has melted. 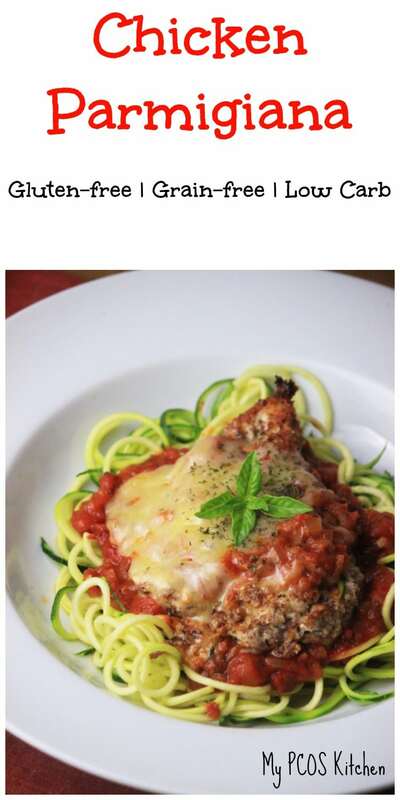 Add the zoodles to a plate and cover with the chicken breast and tomato sauce. I’m not gluten free or anything, so I just used panko crumbs. It was really yummy! The sauce was spot on.